As we are heading for an understanding of Pure Land Buddhism, let's try to keep from getting lost too fast by stating the following basic assumptions. We will return to all four of these points, as we will move along, hopefully at a reasonable pace. Still, a few preliminary remarks on where we're heading will hopefully help us to stay on course. Pure Land Buddhism as a distinct school. Pure Land Buddhism did not come into being as a separate entity until late in the Heian period (AD 794-1185)1 of Japanese history. Its reluctant innovator was Honen Shoshin (AD 1133-1212), whose school came to be called Jodo Shu ("The School of the Pure Land"). 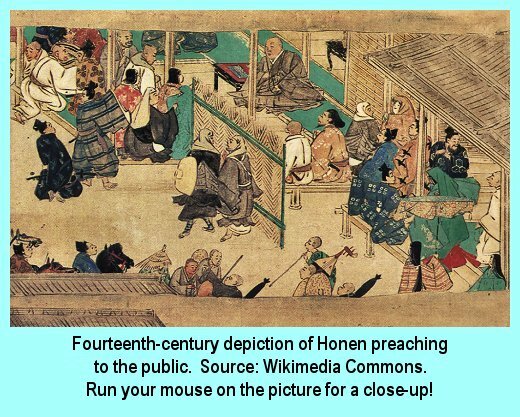 A generation later, Honen's disciple Shinran (AD 1173-1263) became the leader of Jodo Shinshu ("The True School of the Pure Land"), which is undoubtedly the largest and best known Pure Land school. By the time that we are all done, these Japanese schools will have received the greatest amount of our attention. The Pure Land: Here or there? 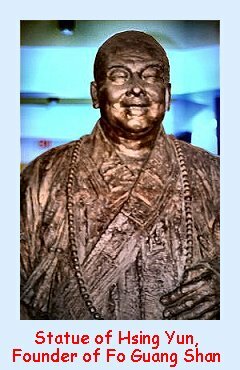 There are a number of "humanistic" orders of Mahayana Buddhism that originated in the twentieth century and are attempting to reach out to a large contemporary audience by emphasizing present concerns and aspirations. Thus, they are focusing on this-worldly goals far more than has been the case for most Buddhist schools in the past. A prominent idea advocated by these innovators is that of "creating a Pure Land on earth," viz. to make this planet an all-around better place to live by proactively addressing environmental and social issues. A case in point is the order of Fo Guang Shan, headed up by Hsin Yun. I need to stress that, regardless of whether it is good Buddhism or not, this focus on a Pure Land on Planet Earth is out of sync with how the Pure Land had been understood until recently. If we do not recognize that distinction, we are bound to get lost when trying to read contemporary Pure Land literature. The more traditional view, which is still also heavily maintained today, has insisted that, if the Pure Land were not remote from our current space and time, its existence would be pointless because it would still have to be subject to the same hindrances to enlightenment that we are experiencing now. My point is not that one is better than the other; I cannot pass judgment on their respective truth within the boundaries of Buddhism. However, I can say that they differ in substance and that they are historically incompatible with each other. Amitabha outside of Pure Land Schools. As you will see, the most important Buddha in Pure Land Buddhism is called Amitabha. His presence is not just restricted to the schools of Buddhism that are strongly associated with Pure Land; you can also run across him in other contexts, where he still may play an important role but not necessarily in connection with the Pure Land. Christian Influence? Because there are some conceptual similarities between Christianity and some forms of Pure Land Buddhism, there has been a long-standing debate on whether Christianity has influenced Pure Land Buddhism. The reverse possibility, viz. that Pure Land Buddhism had a major influence on Christianity is groundless. As Pastor C mentioned in his article, the fact that some Christians and Buddhists within the developing Pure Land tradition in China had contact with each other is well-documented. The same sources, however, show that apparently the same Christians picked up Buddhist terminology to express Christian ideas, which would mean Buddhist influence on Christianity. Regardless, there is no good reason to believe that either side had a significant impact on anyone beyond their immediate geographical surroundings. Any of the Christian doctrines that Christianity could have picked up hypothetically from Pure Land had been a part of the Christian faith for a long time previously. The tracing of supposed influences in the history of religions is always precarious and speculative, and even if a certain connection may have been established, the more crucial question arises as to how significant it could possibly be. As with the other three points above, we need to come back to this issue, but the safest course is to treat Pure Land Buddhism as an original expression of human religious creativity, just as it deserves. 1The Wikipedia articles on specific eras in Japanese history provide a sidebar that gives a quick overview of the periods of Japanese history. It also supplies a more detailed outline as a separate article. The article unnecessarily points out that it is unlikely for such a timeline ever to be considered "complete" by everyone. It supplies much helpful material for the non-specialist. Back to text.